I've finally released my new website after migrating it. The share count on the Hustle Social share widget is wrong. As you can see, it displays 2 facebook shares. However, I know it is more. Last time I made a stat report, there were 195 shares in total and https://www.sharedcount.com/ tells me 198 shares in facebook alone. How may we fix this, please ? This is more than mere vanity, these stats matter in more than one way. I checked this and even if I use directly FB API url that Hustle is using to check this, it returns 198 shares currently. That would mean that Hustle is able to get - or is getting - proper share count but for some reason those are not displayed properly. That might be cache on site or server or a transient cache or there's something on site that's actually blocking connection to FB from it, thus not letting it retrieve proper values. That said, did you try to clear all possible caches on site and server and then check the site again? If not, please try it. If it doesn't help, I"ll need to check the site and since I'm not able to access it, I'll need direct access credentials. I have asked for it already in your other ticket so please just confirm here as well once you send them (or include link to both this and that other ticket in the message that you'll be sending me) and I'll check both issues: this social share count issue and the slow hustle form submission from that other ticket. As this website is currently being modified (even though it is public), I did not enable any cache, so far. Neither on the serveur, neither on HummingBird and both CDNs are disabled at the moment. I've sent the credentials as you requested. I checked the site and the social sharing is currently set on your site to "Click" option for counters. 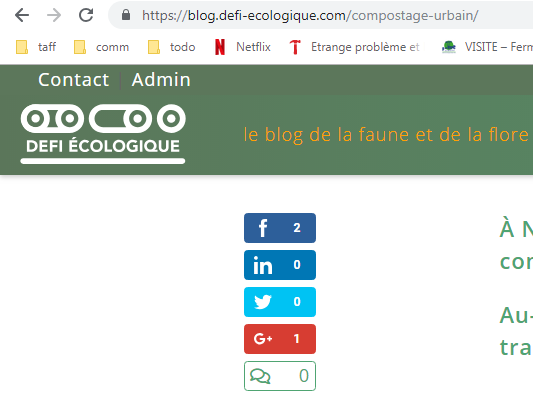 That means that regardless of how many times the given URL has really been shared, the counter will only show how many times someone on your site did click the button to share it. To get real readings, that should be set to "Native" in social share "Name & Services" options page in "Counters" section. However, it seems that there's some sort of bug related to this. I did some more tests on my own setup and it looks like it's either not reading the data properly (even though the FB API URL in plugin's code is proper) or it's just not processing that right way. I've reported it to our developers as a bug so they would look into it. Please note: I'm not able to give you an ETA on a fix. They'll do what it takes to handle that as soon as possible though so please keep an eye on this ticket in case we had some "patch" for you or additional information but also make sure that you're keeping the plugin up to date. How may I get the Twitter and G+ counts displayed ? Like I said previously, the setting should be "Native" instead of "Click" but while that should work, there seem to be a bug so it's not working currently as expected anyway. As I already reported it to our developers as a bug, I'm afraid we need to wait for an update to the plugin that would include a fix or at least some feedback from them that would provide some sort of workaround. We'll update you here as soon as we get to know more from our developers. Thank you. I understood that, but there is also something different about the Twitter account (well, at least it seems unrelated to me). I guess that this message would be there even if the share count was right, there would just be no share counts for Twitter. I think I caused small confusion here and I'm sorry for this. I just read my last response to you and realized that I actually didn't inform you that this is also reported to the developers as it's clearly a thing that needs to be updated as well. I'm sure I wanted to write this (I double-checked my report to developers to make sure that I reported this too) but somehow I missed it. Once again I apologize for confusion. - showing "real count" requires setting option to "native"
Thank you for this information. I'm looking forward to receiving developers' feedbacks. Would it delete my settings if I de-activate and re-activate the plug-in ? I've deactivated and re-activated the plug-in. The sharecount is still incorrect. Besides, I've noticed that it is the same on every page. I've re-enabled Hustle, but now the widget is all broken up. I don't know if it is due to your tests, the re-enabeling or the Smush update (the use of the CDN seems to break images). Are you working on the site right now ? Or may I restore the backup ? Disabling and enabling plugin again wouldn't fix the wrong count. The count is not accurate and doesn't reflect "real count" due to the bug. There's really nothing you could try or do at the moment to fix that. We need to wait until the fix is released. As for the broken widget. It does indeed seem to be related to the SmushCDN. Would you please go to "Smush Pro -> CDN" page and temporarily deactivate the CDN. Clear the cache after that and site should get back to normal. After that please wait a couple of hours and try enabling the CDN again. Apparently due to that release (it's a big change) we're experiencing some temporary overloads of the API. If it still doesn't work after you enable CDN in Smush again after a few hours, please create a separate ticket about that feature breaking the site and we'll check that with our sys-admins. Thank you for your answer. I've done it and I'll enable it later on. Just to let you know that the widget is fixed now that I've disabled the Smush CDN. The share count is still broken, but if it helps, i've noticed that the incrementation is the same on every page, which makes me believe that there some sort of global share count. Do you think that updating to WP5 might fix this ? Or would it compromise your work on all current tickets ? No, upgrade to WP 5 wouldn't fix that. However, I actually noticed that now one of the pages (/banc-refugee) seems to be showing correct FB share count, while the other (/mange) is still stuck to the "pre-set" value. That actually suggests that it might be related to some sort of either FB caching (they do have some caching) or to some internal caching in plugin. I'm not exactly sure but I've added this to my bug report to our developers. Would you have some feedback about this issue ? Do you know when the developers might have been done with it ? I'm afraid that we don't have any ETA about this at the moment but our devs are currently working 3.0.7 release and this has been added on the to-do list for that version and will be investigated during the development. I just had a quick test, following the update, but it seems that it didn't solve the issue. Would you have an ETA ? Yes, you're right. Unfortunately this particular fix didn't make it to the 3.0.7 release do to some additional issues related to other fixes - it must not interfere with other fixes and improvements, that caused an unexpected delay. I apologize for not letting you know earlier. I just checked and it's been moved on to the next release and if everything goes fine (nothing else unexpected shows up meanwhile) it should be included in it. Would you have an ETA for next update ? I'm afraid that we don't have any ETA for 3.0.8 release but a possible patch for this has been provided for testing so it will be included with that release. I was working on performances issues with my hosting provider and they told me that there is an issue with hustle. The Hustle plugin seems to be deactivated but those requests are called 2 times, which shouldn't happen. In case you are not using the plugin then it might be best if it is deleted permanently so that those actions do not get called. In case there are a lot of visitors on the site and those actions get called automatically then there will probably timeouts even if caching is active. I would recommend you to delete them or use an alternative that doesn't call an uncached PHP request. Looking at the function name, I guess it's related to this share count issue. Do you think the patch will fix this ? In the meantime, do you know if there is any settings or tweaks that I may add to wpdiscuz ? The thing is, since it is deactivated it shouldn't be triggered, should it ? As you already mentioned, if the plugin is deactivated, there should be no such calls. Inactive plugin just "sits there" and its code is "left alone" so it's not really even executed, hence any calls triggered by plugin's code shouldn't be executed either. Unless, and while that would be quite surprising as well it could possibly happen in theory, the are because they are really not "disabled" because some parts of the code is actually "hardly" cached. There are solutions (server-side) that do cache already compiled PHP code - which itself should not "execute it" anyway but on the other hand, just theoretically, an "overlap" of different kind of caches could possibly cause the site to include and execute the code that should not be included and executed. That's quite difficult to diagnose and track down though. Maybe there is something wrong indeed in the plugin itself as well but still - I'm not able to replicate it in any way and all the "rules and theories", so to speak, confirm that this should not be happening at all, if the plugin is inactive. I'll give it some more tests meanwhile but the bottom line is, I think we should wait for that update and see how it will behave on our test sites and on your setup. The two conflicting plug-ins are activated. Hustle is activated on the blog only and WpDiscuz on two websites, but only loading on posts. Are these settings related to the ajax call ? Now, this option is deactivated, so it shouldn't run, but who could tell how this is done ? Is there a way to de_register this wp-discuz call ? Thanks for additional explanation but I think we got slight misunderstanding here. With my last response I was under impression that Hustle is currently deactivated on the site - and by "site" I meant "WP install", the entire Multisite. But if it's active e.g. on one of the sites in network, it's perfectly valid and expected that its scripts will be used and that it might be making some ajax calls. What that means is that both these plugins do call e.g. admin-ajax.php file (which is WP core file) but what it does depends on what data plugin sent to it. So as per analogy you could imagine an office assistant when one manager asks this person "hey, bring me a report on sales" and the assistance gets back to this manager and hands sales reports over and then another manager asks the same assistant to set him up on a meeting with a client and the assistant calls the client, sets up a meeting and gets back to that other manager with details. So, one assistant, two different "bosses" with two different tasks. This doesn't create any conflicts. Those tasks are called "in the queue", preformed asynchronously and even though it's still the "admin-ajax.php" file call, they are different tasks. If WPDiscuz allows you to disable WP Ajax, you can try that. It will certainly lower the load but you need to see whether the plugin behavior for you will be acceptable after that or not as it may simply change the way it works. As for Hustle - the admin-ajax.php calls that it does - those shown on the screenshot that you previously provided are indeed related to social shares so in this case, we'll definitely need to wait for that "social shares fix" to be released and see if it helps for these calls as well or if there's yet another fix or tweak necessary for this. Thank you for all this information ! I've modified the behavior or wpdiscuz and asked WPX to check if the issue is still there. If anything interesting comes up, I'll let you know. Even if tracking is disabled: https://take.ms/aG3vr for Popups, Slide-Ins and Embeds those requests are just there but when the plugin is fully disabled they no longer appear. We can disable the admin-ajax.php for the front-end of the site and allow it only for your IP but at the moment I would advise you to ask the plugin developers or temporarily disable the plugin. Would you have anything to suggest, following their answer ? These calls in Hustle - those reported by your host - are related to what we are discussing here from the beginning: share count. What you can try for now, apart from disabling the plugin entirely, is to actually disable/remove the "Social Share" that you got created there from it. That would also remove "Social Share" icons/module form site though. Any other way - like somehow blocking/disabling those calls - would most likely break the plugin (which might even result in unexpected behaviors of other aspects of the site). I really would hold on with this until update that will contain the fix for social shares and see then if it helps (especially that two ajax calls is not really much and is nothing unusual in case of WordPress). But still - this is strictly related to social shares so it's either disabling them or the plugin or waiting for the update and only if the update doesn't improve the situation, we can then investigate it further to see what else could be done to make it better. I'll wait for the next update then.